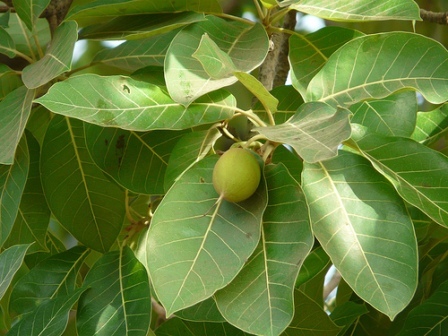 Mahua, which is a native of India, is a tree of high economic value in India. It is a characteristic tree of the dry region. It grows in north and central India. It also grows commonly in the Indian states of Orissa, Andhra Pradesh and Gujarat. The tree is very well known to rural folk since ages in India. Mahua prefers tropical climate. It can withstand drought admirably. This tree does not survive under waterlogged conditions. Since it is a very hardy tree, it can grow even in pockets of soil between crevices of barren rocks. Trees even grow on degraded rocky areas including salt- affected soils. However, for its better growth and productivity, well drained, deep loam soil is ideal. Though a large variability occurs in its fruits but still there is no improved variety of mahua for an organized orcharding. Recently some selectionshave been made at N.D. University of Agriculture and Technology, Faizabad in Uttar Pradesh. These are; NM2, NM4, NM7, and NM8. Mahua plants raised from seed take 15-20 years for coming into bearing. These also exhibit large variability. So these should be propagated vegetatively. Veneer grafting gives 90% success. For this, seedlings are raised to be used as rootstock. Mahua seeds have no dormancy. Fresh seeds after storage of 5-6 days at room temperature show 80% germination. Seeds can be sown on raised beds or in polythene bags about 30 cm deep during July. Seeds geminate within 10-15 days. The seedlings become ready for transplanting in 1 year. Scion wood should be taken from selected mother plants for grafting. July is the ideal time for veneer grafting. Grafts become ready for planting in September, just 2 months after grafting. 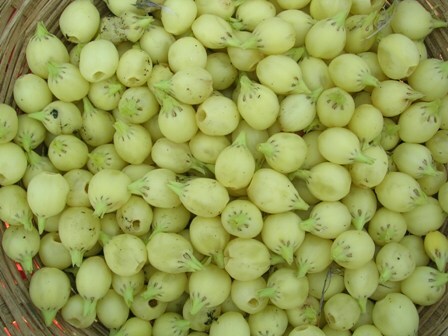 Polyembryony exists in mahua seeds and 15-20 % seeds produce nucellar seedlings. The seedling plants should be planted 10 m apart whereas grafted ones 8 m apart. The pits of 1m x 1m x 1m size are dug and filled with a mixture of top soil + 25 kg farm yard manure up to a level of 6 cm from the ground level. Water the pits to settle the soil. Planting is done in the centre of the pit during July- September. Training is very essential to develop proper framework of mahua plants. Plants are allowed to grow straight with the help of stakes. The framework should be developed by encouraging the growth of 4-6 well spaced branches on the trunk at a height of 90 cm from the ground level. Pruning is not performed in mahua plants except removal of dead, crossing branches. A dose of 10 kg farmyard manure, 100g N, 50g P and 75g K/ plant should be given to one year old plantation. It should be increased every year in the same proportion up to the age of 10 years. Thus fully grown trees require 100kg farmyard manure, 1kg N, 0.5kg p and 0.75 kg K. farm yard manure should e applied during July-August. Half dose of N and K and full dose of P should be applied a month before flowering and remaining half dose of N and K after fruit set. The manure and mixture of fertilizer should be spread under the canopy of plants and incorporated in the soil. Plants should be irrigated immediately after manuring and fertilization. Zinc deficiency has been observed in mahua plantation grown under sodic soul, hence application of zinc is very beneficial for proper plant growth. Light cultivation is required to keep the plantation weed- free. 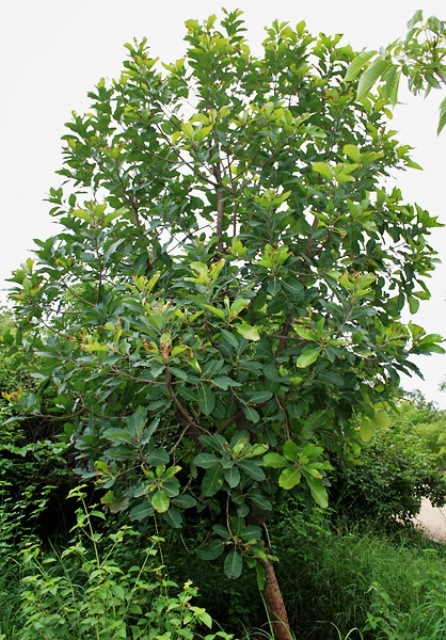 Mahua trees grown on poor soils require green manuring. Intercropping with sunflower or mustard, seasonal vegetables or Karonda fruits, can be done to utilize the spaces up to 6 years. Basin system of irrigation which has uniform distribution of water should be used for young plantations. For fully grown trees, strip or bed system should be followed. Irrigation should be given after planting, manuring and fertilization. Irrigation should not be given during dormancy or leaf fall period and flowering (March–April). Irrigation after fruit set (May) is important for retention and development of fruits. 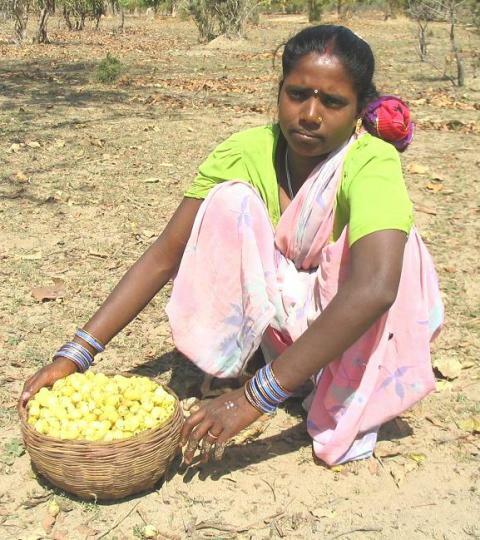 Mahua yields both flowers and seeds. When mature tree is in bloom the ground beneath it is cleaned off weeds. The creamy coloured, fleshy corolla (flowers) fall in early hours of the morning . they should be collected. Falling of corolla continues for 15-30days. The ripe fruits shed from trees during June – July. They are collected by hand for storage and in heaps for seed extraction. The yield of flowers (dry) varies from 100- 150 kg and kernel 60-80kg/ tree/ year. The productivity of seedling plants continues up to 50 years. The flowers before storage are dried. As soon as they are collected they should be dried on polythene sheet. Do not store them in bulk in moist condition. Flowers should e stored in thin layers. They should be turned over from time – to –time to bring the lower layers to the top. Dried flowers after packing in gunny bags are stored in a dry place up to 1 year under ordinary conditions. Seeds are extracted from ripe fruits. They are shelled within a week otherwise they germinate. Once the seeds are germinated, they become unfit for oil extraction. Kernels obtained after shelling should be dried up to moisture content of 8%because seeds containing more than 7-8% moisture are liable to fungal attack. Dried kernels can be utilized for extraction of oil. The kernels can be packed in gunny bags and stored for a year. Both fresh and dried flowers are used for preparation of various nutritive food products which form an article of diet. Mahua flowers are largely used in preparation of distilled liquors, alcohol and portable spirits. It is also used for preparation of cake, vinegar, jam, syrup and honey. Flowers and spent flowers (after fermentation) are utilized as feed for livestock. The fruit pulp can be used as a source of sugar for alcoholic fermentation. Dry fruit husk may be used for preparation of absolute alcohol (one ton dry husk yields 130 litres absolute alcohol). Seeds processed for oil are used to manufacture of vanaspati (hydrogenated oil), soap, greases and cosmetics. Seeds are also use for preparation of defatted seed flour having a great potential in bakery products. The saponin obtained after extraction has industrial and commercial application. Mahua cake obtained is used as manure and has insecticidal properties. Every part of mahua yields economic products of great potential value, hence mahua constitutes most important raw materials for various industries.